If you plan on taking on such a big project as painting your home, or hiring a painting contractor to do it for you, you will need to give your house a visual inspection for any rotted wood that will need to be replaced before painting can begin. Ladder accidents alone account for 90,000 injuries every year. These injuries involve men, woman and children. OSHA (Occupational Safety and Health Administration) believes that 100% of all ladder accidents could be prevented, if proper attention to equipment and climber training were provided. Before you set up the ladder, make sure there are no power lines that can come in contact with the extension ladder. Make sure your ladder is set up with the proper ladder angle. This is extremely important. For every 4ft. of ladder length, the base of the ladder should be 1ft. out from the base of building or from the eave of the house, whichever is the furthest point from the building. Make sure the ladders feet are level before climbing. If the ground feels loose, dig the feet into the ground to prevent the base of the ladder from slipping. When placing an aluminum extension ladder against an aluminum gutter, you will need to tie off the top of the ladder to prevent it from being blown down by a gust of wind. Metal against metal creates a very slippery surface. Attach a rope to one of the gutter brackets to secure it in place. When climbing a ladder, never carry tools or equipment. You should maintain 3 points of contact at all times. 2 hands and 1 foot or 2 feet and 1 hand. 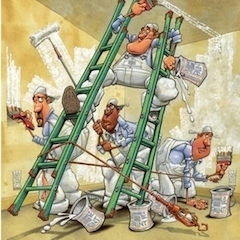 When painting from a ladder, a new product called the Buddy System from Big Boy Ind. allows a painter a hands-free solution by having a paint bucket holder that attaches to your belt. It has a custom designed removable dripless paint bucket that drops down inside the holder for a secure fit. The paint bucket also has a brush holding magnet to carry the brush. The dripless paint bucket holds over a quart of paint which is more than enough paint to cover the area you can work from a ladder. When working off an extension ladder, keep your belt buckle inside the rail of the ladder. Never lean further out than the middle of your waist. You could cause the ladder to shift and lose your balance. Working from a scaffolding is another area of concern. 37% of all construction falls are from ladders and scaffoldings. Scaffolding accidents tend to be more serious than ladder accidents. Ladder accidents account for 15 days absence from work and scaffolding accidents account for 21 days lost from work. Along with climbing accidents, there are other hazards involved with scaffoldings. You should always maintain a clean deck surface to walk on. Workers can trip and fall from tools and material being in their way. You can also seriously injure someone down below you from knocking things off the scaffolding or even cause property damage. A safer way to work when painting off of scaffolding is to use the Buddy System paint bucket holder with dripless paint bucket that positions your paint bucket at your side for easy access. This eliminates having a paint bucket that you will need to either carry or place it on the deck surface where it could cause you to trip and fall and cause a serious accident. To refill the Buddy System, you can use a rope to tie off a refill gallon kept on the ground safely out of the way. When needed, pull up the gallon of paint. The Buddy System also has tool openings for 2 screw drivers and a multi-purpose tool. Just take out the multi-purpose tool and remove the lid of the refill gallon and full up the bucket. Place the lid back on the gallon and lower it to the ground. We’re all in such a big hurry that a lot of these accidents could be prevented if you use some common sense and the proper tools for the job. Scaffolding has been traced back to over 17,000 yrs. ago. Cave paintings in Lascaux suggest that scaffolding was used for painting the ceilings by finding sockets in the walls to hold wood supports. The ladder has been in use well before 5000BC. There is no record of when the first ladder was invented. With any good paint job, it takes proper prep work to get a long lasting paint job. If you’re rushed for time and need to take a short-cut, I recommend you hire a professional painter. Take some time and walk through all your rooms to determine what you will need for supplies before heading down to your local paint supply store. Check your ceilings for any yellow marks caused by a roof leak that’s been repaired, or ceilings that have been neglected for many years. If this is the case, you will need to apply a coat of stain sealer to the water marks or in the case of the whole ceiling being yellow, apply a coat on the entire ceiling. I find that people are surprised how dirty their ceilings are after applying some new ceiling paint. 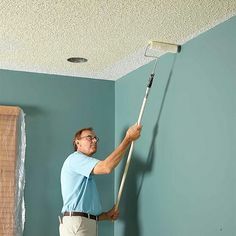 In most cases you will need to apply two coats of paint on the ceiling for a nice finish, and by using a stain sealer you avoid any stains from bleeding through the new coat of paint. If you have crown moldings that run along the top of the walls and against the ceilings, check for cracks that will need to be filled with latex caulking. When using caulking, cut between a ¼” to 3/8” slit in the end of tube. This will allow you a nice width of caulking for filling cracks. 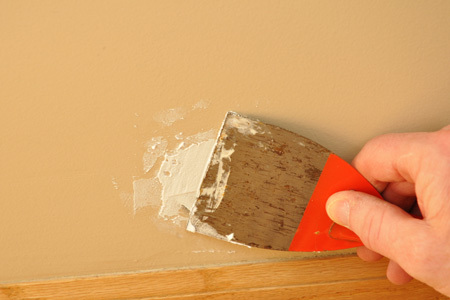 Make sure you have a rag on hand and smooth any excess caulking with the end of your finger. Another area that usually has cracks that should be filled with caulking are the tops of baseboards. Taking these extra steps, makes for a professional paint job. Any holes in woodwork will need to be filled with putty. I prefer using Durham’s water putty. It comes in a container that is in powdered form. It’s easy to mix, just add water and dries quickly to a hard finish. Once it hardens, use a sheet of fine sand paper to finish. It also can be stored for years with-out the worry of it drying up. Once you complete sanding all the holes, apply a coat of primer. This is also a good time to check what type of paint was previously used on your woodwork. ( Oil or latex) One way of testing the paint is to take a rag with alcohol and rub it back and forth across the woodwork. If paint comes off on to the rag, it’s latex paint. If paint does not come off, it’s oil base paint. If you do not have any alcohol, you can also test with sand paper. Rub back and forth with a piece of sand paper. If a fine dust comes off, it’s oil base paint. If you find that the sand paper has been gummed up with paint residue, it is latex paint. If you decide that you would prefer to go over the oil based paint with latex, you will need to either lightly sand the woodword or use a paint deglosser on the surface. You will also need to apply a coat of bonding sealer over the woodwork so that the latex paint will properly adhere to the woodwork. Zinsser’s B-I-N primer and Kilz are two quality primers you can use for all the above priming situations. When applying the sealer, I find that using a 2 ½” brush work best along with a paint pail. Big Boy Ind. has a new dripless paint bucket that holds a quart of paint and is ergonomically designed to fit comfortably in your hand. Its has a dripless wiping flange that allows you to paint with-out the worry of paint dripping down the outside of the paint pail and getting on your floors. 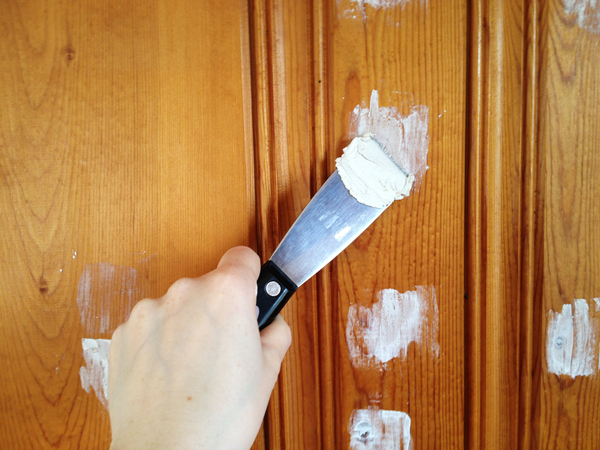 Applying latex paint to woodwork previously coated with latex paint is a much easier process. If the surface has a shine to it, you will need to lightly sand or use a deglosser before applying another coat of latex. 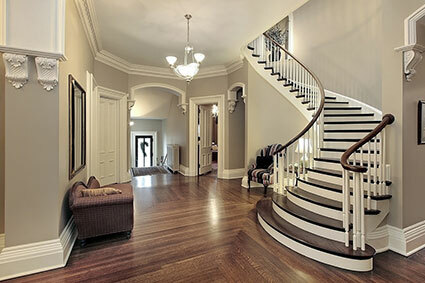 These steps are necessary for a good bond to the surface of the woodwork. When preparing your walls for painting, fill any holes from hanging pictures, mirror frames and any other unsightly blemishes. Dap makes a product called Fast N Final that does not shrink or crack and dries quickly. You can also sand this product if needed. This product also does not need to be primed coated. Once you have all your prep work completed, before painting, move all the furniture away from walls and clean behind all these areas where dust has accumulated. You can use TSP Cleaner (Tri-Sodium Phosphate) for any hard to clean areas especially in the kitchen where you may find grease stains. Give every room a good vacuuming, including woodwork before doing any painting to avoid any dust from blowing on new paint. I also recommend that if you have done any sanding, go over these areas with a damp cloth to remove fine dust. 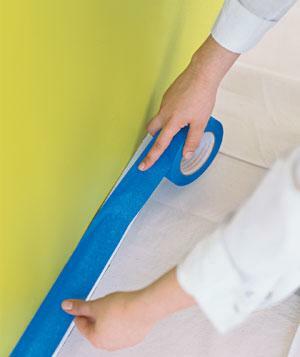 Once you have everything prepared for paint, you will need painters tape to protect areas where you will be cutting in around the woodwork. Regardless of your experience, whether you’re painting for the first time or an expert, I always recommend you install painters tape along the top edge of baseboards. When your rolling out the walls, paint will splatter and end up on the baseboard if not protected. When choosing rollers for painting ceilings and walls, spend the extra money to get a quality roller. This is not an area to skimp on. Less expensive rollers will leave a fuzzy material from the roller on your ceilings and walls. Some of the tools you will need for the prep work include a multipurpose tool that’s performs many functions, a scraper, nail remover, putty knife, paint can opener, and roller cleaner. You will also need screw drivers to remove various wall plates and a painters rag. A product called the Buddy System is a paint bucket holder with custom designed dripless paint bucket. The holder which attaches to your belt, positions your paint bucket at your side for easy access, allowing you to work more comfortably without having to carry your paint bucket. It also has built in tool openings for two screw drivers, multi-purpose tool and side hooks for painters rag and cut-in tape. With proper planning, you can end up with results, just like a pro. During your lifetime, you will probably pick-up a paint brush and do some dabbling of paint. Whether it be working on your own painting project, or helping out a friend. Before you head down to your local paint or hardware store, let’s take a look at some of the painting tools available that will make this a more enjoyable project, rather than a painting nightmare. June is National Safety Month and the American Ladder Institute (ALI) is encouraging all companies and workers who use ladders to learn about proper ladder practices. 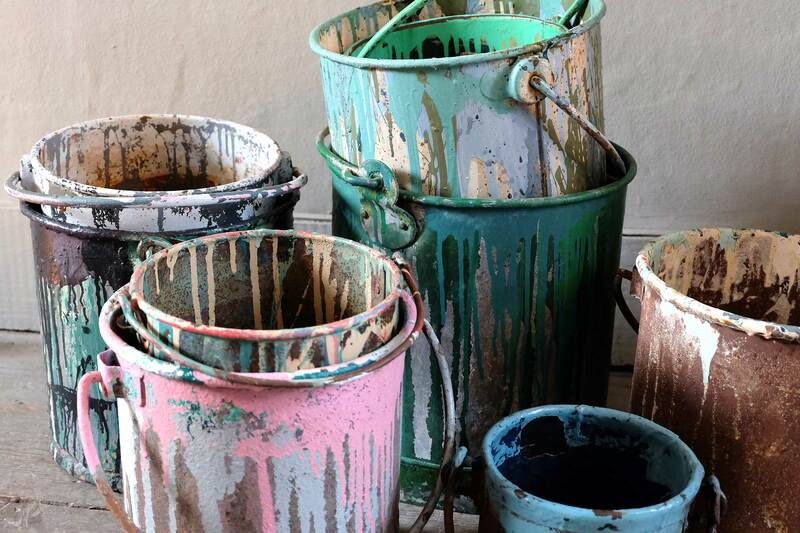 If you have done any painting over the years, you can relate to carrying around a bucket of paint, dripping paint from around the rim, leaving paint drips everywhere we go. After a while, you get tired of carrying the container and leave it next to you, only having to bend over repeatedly to reapply paint to your brush. As we get up there in age, having worked many years in the construction industry, you know what’s it’s like to get up every morning and drag your aching body out of bed for that next pay check. We’re all so busy with our daily lives, we don’t spend enough time trying to make are jobs a tad easier by searching for the right equipment to eliminate some of this pain. In mid-June 2013, a painting contractor was hurt in Maryland when a paint bucket fell and struck him in the neck. Emergency responders assisted the injured worker where he was removed by ambulance and then transferredto a Medevac helicopter to be flown to University of Maryland Shock Trauma Center.